Repoint mortar joints between bricks or blocks! Use this Type O Mortar, indoors or outdoors, for repointing or non-load-bearing wall applications. This product is designed for any masonry application where low strength and superior workability is required. Available in 2 KG pails. Go with SAKRETE, The Pro's Choice since 1936. SAKRETE High Strength Anchoring Epoxy is a two-component epoxy compound that cures to an exceptionally strong, hard product. This unique formulation provides an excellent balance of mixability and flow without run-out to allow for the fastening and anchoring of both vertical and horizontal fixtures into masonry applications. Available in 255 mL tubes. Go with SAKRETE, The Pro's Choice since 1936. Construct foundation walls, retaining walls, manholes or sewers! Use this pre-blended, Type S Mortar designed for laying concrete blocks, hard brick or stone. For load-bearing walls requiring high compressive strength. Available in 30 KG bags. Go with SAKRETE, The Pros Choice since 1936. Create custom cement mixes, landscape, or increase traction! Use SAKRETE Multi-Purpose Sand, a high quality, mortar sand, for a wide variety of projects. Available in 25 KG bags. Go with SAKRETE, The Pros Choice since 1936. SAKRETE Non-Sag Sealant repairs cracks or fills joints in horizontal, vertical and overhead concrete surfaces. This product is one-component sealant that forms a flexible joint with excellent adhesion. Available in 300 mL tubes. Go with SAKRETE, The Pro's Choice since 1936. 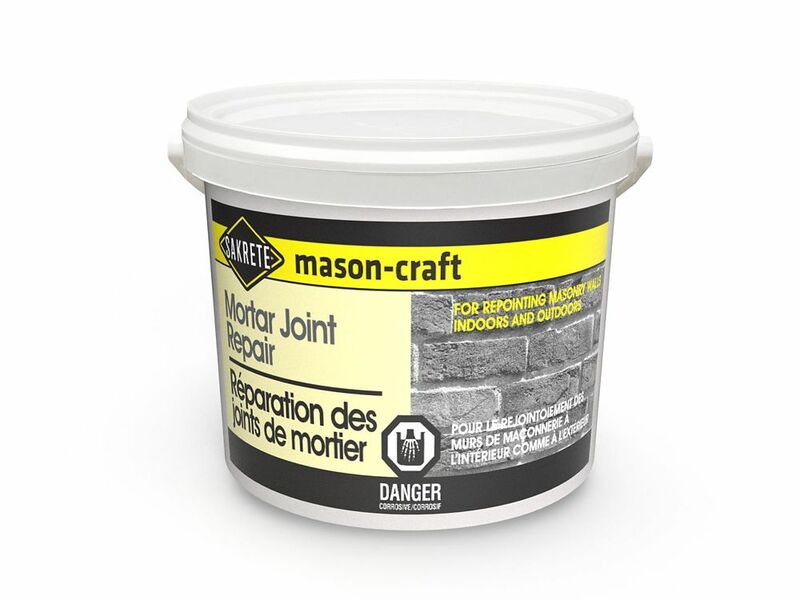 Mason-Craft, 2 Kg Repoint mortar joints between bricks or blocks! Use this Type O Mortar, indoors or outdoors, for repointing or non-load-bearing wall applications. This product is designed for any masonry application where low strength and superior workability is required. Available in 2 KG pails. Go with SAKRETE, The Pro's Choice since 1936.